Sean Baker's film is a moving and poignant look at childhood and poverty. 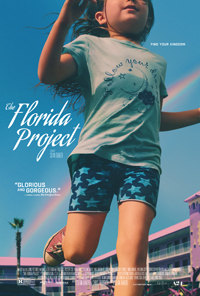 Set on a stretch of highway just outside the imagined utopia of Disney World, the film follows six-year-old Moonee (Brooklynn Prince) and her rebellious mother Halley (Bria Vinaite) over the course of a single summer. They live week to week at "The Magic Castle," a budget motel managed by Bobby (Willem Dafoe), whose stern exterior hides a deep reservoir of kindness and compassion.